House extensions have really come of age in recent years. TV shows such as Grand Designs Amazing Spaces, along with websites such as Houzz and Pinterest have demonstrated that architectural ambition is not only restricted to large-scale, modern city-centre commercial developments. All across the UK, there is now a strong urge to bring cutting edge design into the heart of our homes. Extensions can transform and expand our living spaces, whether it’s opening up the traditional layout of an older property, in order to create an open-plan, modern, family-friendly home, or the introduction of infinitely more natural light by incorporating floor-to-ceiling bi-folding or sliding doors, or sky lights or roof lanterns. One of our recently completed Architectural extension projects, in Baildon, near Bradford. If it is spacious and inviting, a well-designed extension can improve the way a home is used and it can even enhance your entire lifestyle. And, with the summer months now upon us, a popular addition is the garden extension, or garden room. Sitting rooms with lots of glass, thus allowing the garden and home to connect. And, that’s not all. A contemporary kitchen extension, with central island, breakfast bar and clever use of cupboard space and storage, to create sleek, clean lines, and a minimal aesthetic is also a popular option. A basement conversion or loft conversion are similarly useful ways of incorporating the additional space you may require. So, before your project begins, here are a few useful tips to help you along the way. One of the most important secrets to creating a successful extension is a very clear brief. Write down your aims and objectives and find some pictures similar to your own ideas. Pinterest, Houzz and variou Architects’ websites will be awash with wonderful, inspiring images. Even consider developing a scrap-book, which is useful for whenever you see any snippets of inspiration. Here at Mash Architecture, we will develop your brief and help realise your ideas, so it is a good idea to obtain these services as early into the process as possible. We always try and ensure a working relationship which is comfortable and open. It’s important that you feel you can ask questions, while our Architectural & Design input will always provide new ideas. Some Architectural practices specialise in commercial projects, others in education, others in residential and so on. Here at Mash Architecture, we have experience of all sectors however, our main day-to-day focus is on residential design, in the form of extensions, conversions, refurbishments and new houses. Therefore, we are well equipped to help you with your extension project, should you require our services. In order to develop the best Architectural solution, it’s important to not only know what you will want the extension for, but also how you plan to use the space. How you plan to use the room will influence how it’s designed. Are you the ultimate host and require the ultimate kitchen space, or perhaps you’re a book-worm who requires a cosy and inviting home library? The design stage is the best time to ask questions. Looking at other similar projects which we have undertaken at Mash Architecture will be a good starting point for inspiration. And, always remember, it’s always easier to make changes during the design stage than further down the line (i.e. once works have started). As we always say “Whilst it’s a line on a drawing, it’s always easy to change”. Once a design solution has been agreed, Mash Archiecture will create the drawings for planning and building regulations and apply for planning permission. This is relatively straightforward providing there is sufficient consultation. Once the applications have been submitted to the relevant authorities, our standard practice is to liaise with the planners or building control, if necessary, in order to ensure that the relevant approvals are obtained on your behalf. Planning permission is not needed however, for many types of extensions. Here at Mash Architecture we will advise you, during the initial consultation meetings, on the types of works you can implement without planning permission (i.e. under permitted development) although, if you live in a listed property or within a Conservation Area, these permitted development rights may vary. Undertaking a building project is messy, time-consuming and can be stressful to see your home turned upside down. If you can move out, then you should do so, but visit the site regularly to monitor progress. Here at Mash Architecture we will advise you on the practicalities of having the building work carried out, and we’ll often work with the main contractor in order to come up with suggestions on how to minimise any potential disruption to your home. It’s also worth keeping your neighbours informed of any building work and limiting the noise to reasonable hours. We always provide a very detailed fee proposal prior to our appointment on any project. This is essentially a breakdown of our fees and involvement during the project, which will also include details of planning and building control fees and whether any additional consultant’s fees may be required, such as those of a structural engineer. 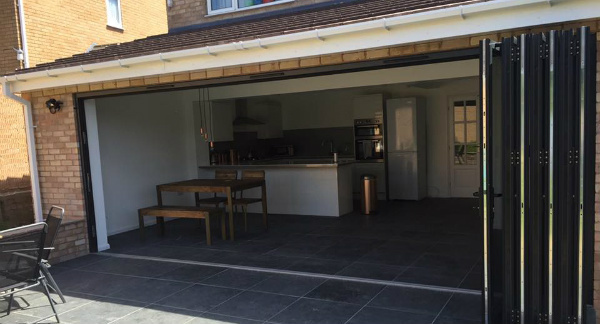 As we have successfully completed several hundred house extension & renovation projects, we are also usually able to provide a reasonable estimate of overall building cost before you commit to a project. We advise allowing four to five months from the feasibility study to tendering for construction. Building work depends on the size of the project, but on average, a garden sitting room takes about three months, while a small loft conversion is probably about eight weeks. A very large two-storey extension may take five or six months to complete however, we would always ask the contractor for a detailed programme of works when inviting them to tender. If you are considering undertaking a building or renovation project and you require Architectural, Planning or Design services, then please get in touch via our contact page.